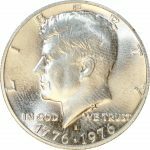 The Kennedy Half Dollar has been minted from 1964 to the present. In honor of the assassinated President John F. Kennedy the obverse was designed by Gilroy Roberts and the reverse with the presidential coat of arms by Frank Gasparro. For the United States Bicentennial in 1976, the reverse of the Kennedy Half Dollar was redesigned by Seth G. Huntington with Independence Hall in Philadelphia.